Having apps and software is fine, but this is an area in dire need of improvement and not only improvement but someone has to start up from a scratch. Virtually there are no, or very little properly marked mountain trails, let alone eco-trails, etc... It is pity because Armenia has so much to offer to hikers, bikers, and just ordinary mountain lovers. have been looking at his program, love it !!! Edited by onjig, 17 October 2017 - 10:25 PM. It is not about trekking anymore. One thing leads to another... Armenia is like a stuborn virus - once in, never out! My son, Marc, and I had tramped through shin-deep snow for several hours, and by the time we reached the blustery top of the peak, we couldn't see more than 25 feet because of a whiteout. 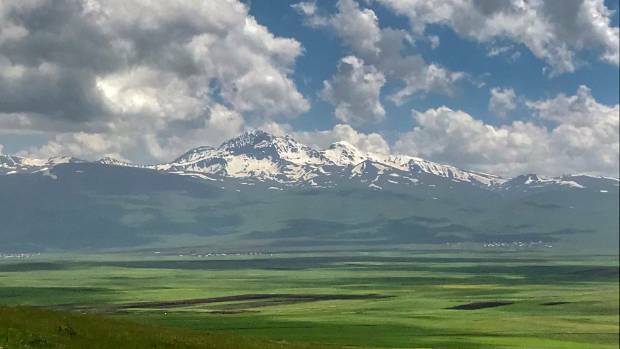 The four Aragats peaks, surrounding the massive caldera of an extinct volcano, form the highest point in Armenia and remain snow covered through at least June. What the country lacks in affluence is offset by the warmth of the people, whose identity is anchored to its long history. Yerevan, the capital, was founded in 782 BC, decades before Rome. Between hikes, you can visit ancient temples and some of the oldest Christian churches in the world. 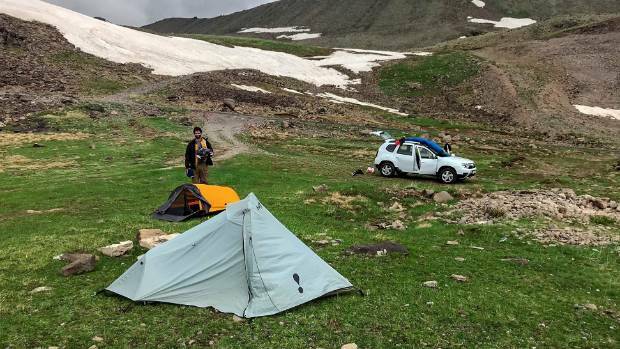 But anyone who frequents more well-travelled mountains would find a few surprises and challenges in hiking or climbing in Armenia. Our campsite near Kari Lake at about 3000 metres elevation. Just how surprising travelling around Armenia could get dawned on me when Marc and I rented a car in early June in Yerevan, and the rental agent warned me that my California driver's license wasn't strictly legal. If I was stopped by police, he said, just offer money. How much, I asked? About US$10 would be more than enough. Now that's the kind of advice you don't get at a US rental counter. Fortunately, it wasn't needed. Just to get to Armenia requires a long flight but the country rewards those who make the effort. 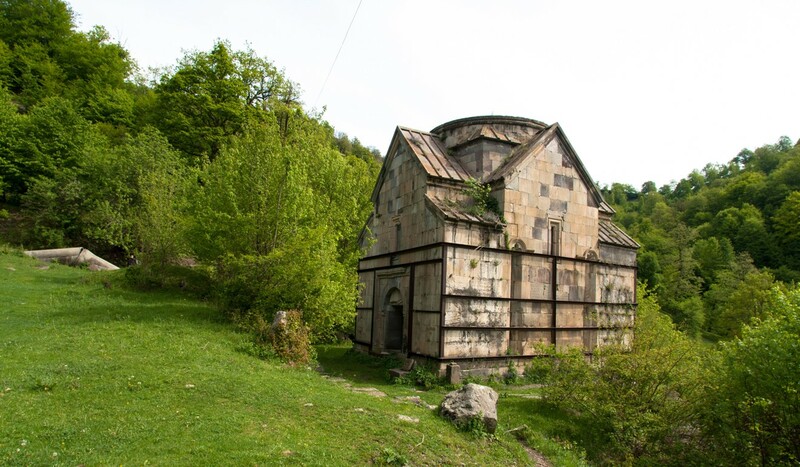 A reasonably short hike in Dilijan ends at the ruins of the 11th Century Jukhtak Vank church. 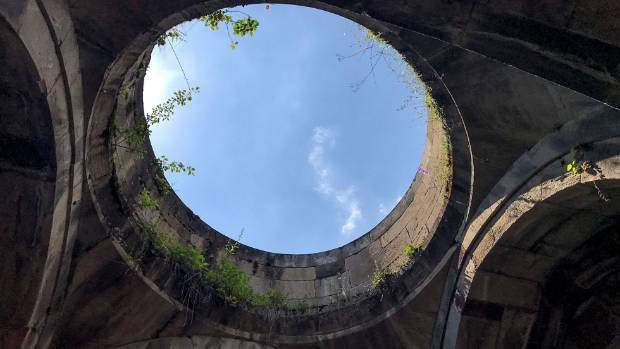 The church dome has collapsed. A shepherd watches his flock along the road to Kari Lake at the base of the Aragats peaks. A few days later, I met park superintendent Armen Abrahamyan at the park's headquarters just outside Dilijan. The park now has 124 miles (199km) of trails, about half of them on the TCT, he said. Some of them are Jeep roads, although we didn't encounter vehicle traffic on our hikes. The TCT will eventually extend from Georgia through Armenia, covering 1864 miles (2999km) and connecting existing and future national parks. 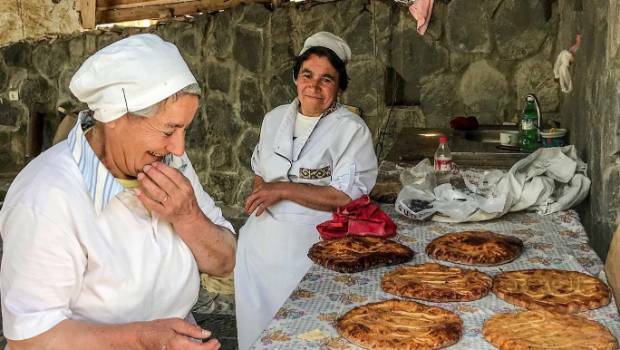 A roadside bakery near Geghard sells Armenian sweetbread, a good item for the backpack. It wasn't until I got to Armenia that things fell into place and I met Hovik Mizrakyan, a jewellery designer and strong hiker affiliated with FindArmenia.com. Marc and I camped the night before at sub-alpine Kari Lake. There were no fire pits, picnic tables, fee stations or infrastructure you'd expect when car camping. Mizrakyan would meet us the next morning. We met a group of Belgians camping nearby, led by Nver Avetisyan, a friendly mountain guide. He drove the only Dodge Caravan we saw on our trip. ("I like American cars," he said.) He invited us into his dining tent for some tea and coffee. We brought a bag of ripe cherries we had bought earlier and talked about the future of democracy in Armenia. Emirates flies from New Zealand to Dubai and then onward to Yerevan. Ibis Yerevan Center Hotel, 5/1 Northern Ave., Yerevan: lat.ms/ibisyerevanhotel. Discount European hotel; doubles from US$65. Avan Dzoraget Hotel, 1st Street, Building 127, Village Dzoraget; tufenkianheritage.com/en/accommodation/avan-dzoraget-hotel. Awesome hotel north of Yerevan. Part of the Tufenkian Heritage Hotels chain. Doubles from US$151. Lahmajun Gaidz, 5 Nalbandyan, Yerevan; lat.ms/lahmajungaidz. 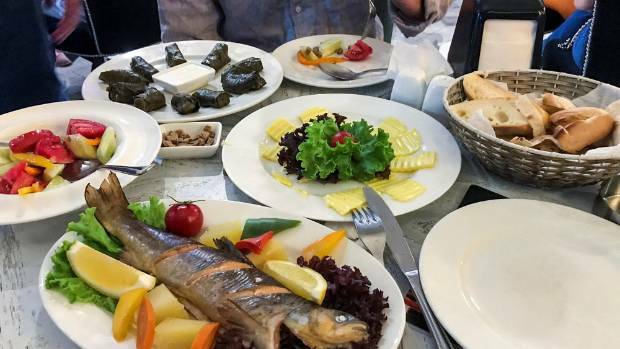 Terrific lunch fare (we tried lamb and beef lahmajun, a kind of Armenian pizza) just off Republic Square. Lunch for two was less than US$10. If you are planning to day hike, you'll obviously want the standard equipment: day pack, lightweight boots, good rain gear, water bottles, sunscreen and lots of moisture-wicking clothes. If you are backpacking, keep in mind that camping stove gas will be difficult to find and that you can't take it with you on the plane. My son, Marc, and I had tramped through shin-deep snow for several hours. By the time we reached the blustery top of the peak, we couldn’t see more than a few metres around us because of a whiteout. Somewhere in front of us was a deep crater and the surrounding peaks of a volcanic rim we had hoped to reach. But as we stood on one of the highest peaks in Armenia’s Caucasus Mountains, we were satisfied we had made it this far. For much of the last century, nobody would have considered the former Armenian Soviet Socialist Republic a hiking destination. But a few decades of independence and a strengthening democratic government have given the little nation a growing reputation as an interesting and safe place for hiking. We met hikers from France, England, Canada, Belgium and Australia in just a few days on the trails. The nation’s beautifully wooded Dilijan National Park resembles America’s Great Smoky Mountains National Park. 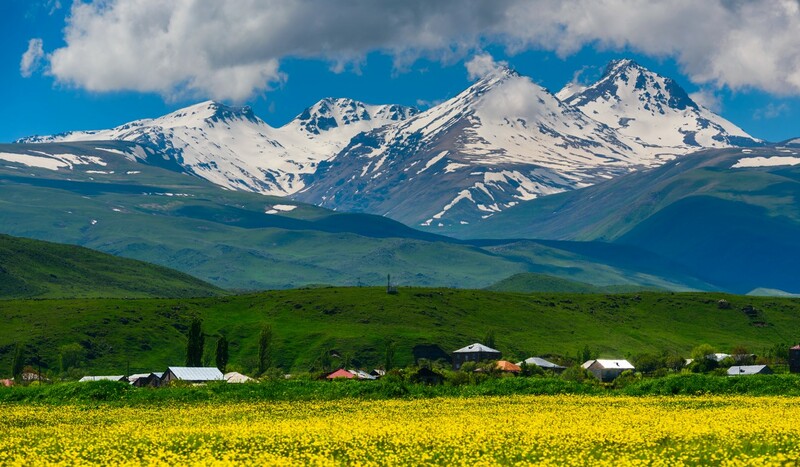 The plateaus of its volcanic Mount Aragats, 40 kilometres northwest from the capital Yerevan, look something like the high country in California’s Sierra Nevada, with barren igneous rock, gravelly slopes and snow-covered peaks. 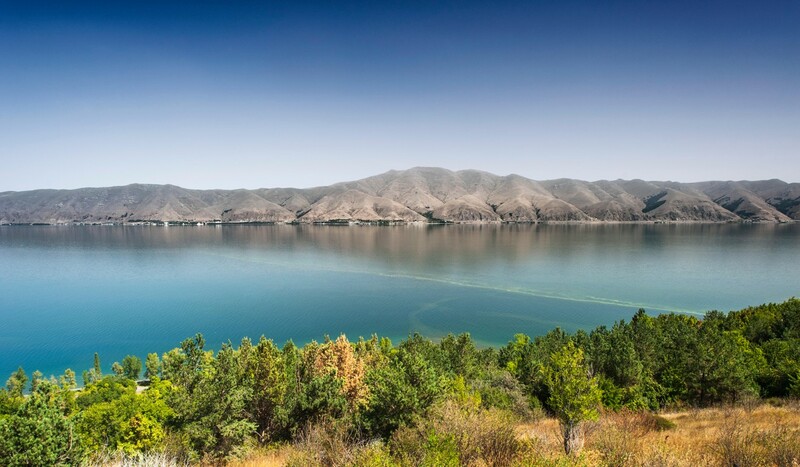 Lake Sevan in eastern Armenia is twice as large as Lake Tahoe in the Sierra Nevada. Although its waters don’t have the clarity that makes Tahoe so spectacular, you won’t find a traffic jam around the lake’s perimeter or dense neighbourhoods of mansions. What the country lacks in affluence is offset by the warmth of the people, whose identity is anchored to its long history. Yerevan was founded in 782BC, decades before Rome. Between hikes, you can visit ancient temples and some of the oldest Christian churches in the world. 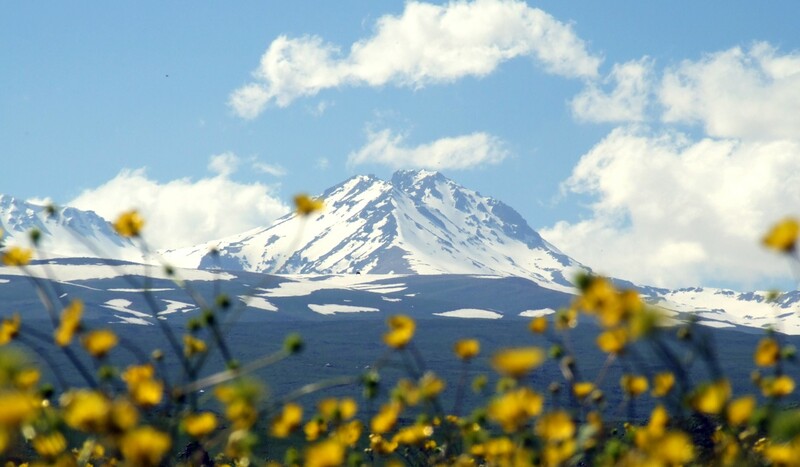 You may find a few surprises and challenges in hiking or climbing in Armenia. Often trail heads are not marked. The weather will be unpredictable. The flora will be foreign. You might end up driving your rental car across a boulder-strewn mountain river to get near a trail. If you find a topographic map, it will probably be written in Armenian – which doesn’t use the Latin alphabet. It dawned on me just how surprising travelling around Armenia could get when Marc and I rented a car in early June in Yerevan, and the rental agent warned me that my California driving licence wasn’t strictly legal. If I was stopped by police, he said, just offer money. How much, I asked? About US$10 would be more than enough. Now that is the kind of advice you don’t get at a US rental counter. Fortunately, it was not needed. Just to get to Armenia requires a long flight. That is important in planning strenuous hiking, because if you are flying from North America it takes a while to get over that day-to-night jet lag. But the country rewards those who make the effort. It will be a liberating experience from the crowded trails, packed car parks and scarce back-country permits in California. In fact, you won’t need any permits in Armenia. I had long searched for a good reason to visit Armenia. When I was growing up in Detroit, my father often reminisced about growing up in the Caucasus Mountains in the early 20th century. Marc had just completed graduate school and had a one-week window to join me in Armenia. He spent a week surfing in Indonesia and flew west, and I flew east. 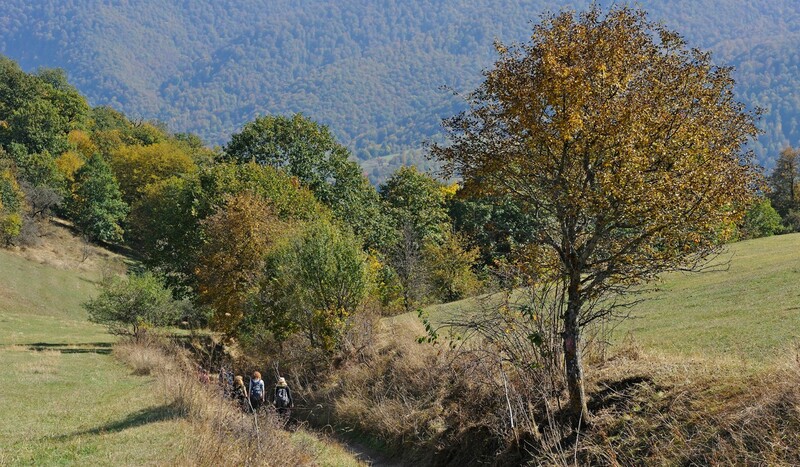 We went on two hikes in Dilijan National Park. The first was to pleasant back-country Gosh Lake, along the Transcaucasian Trail, or TCT. At the lake, we met a Canadian hiker who seemed lost. He joined us, and we gave him a ride back to the town of Dilijan. A few days later, I met park superintendent Armen Abrahamyan at the park’s headquarters just outside Dilijan. The park now has 124 miles (200km) of trails, about half of them on the TCT, he said. Some of them are Jeep roads, although we didn’t encounter vehicle traffic on our hikes. The TCT will eventually extend from Georgia through Armenia, covering 1,864 miles and connecting existing and future national parks. Our second hike took us to the ruins of the 11th-century Jukhtak Monastery, deep in a forest. I imagined how people, isolated from the rest of the world, would hike to that mountaintop 1,000 years ago. It seemed such a far cry from driving to a church car park these days. I found a crude digital topographic map of Aragats on the internet. I wasn’t sure there was an actual trail, and we didn’t have time to find our own route. I quickly realised we would need a guide. A hiking brochure, produced under the sponsorship of the US Agency for International Development, advised using guides for many of the much less ambitious hikes in Armenia. The only problem was finding a good one. I talked with Armenian travel agents, Armenian journalists and Armenian aid officials. I found hiking guides online and tried to email them. I talked with a couple of guys with the Armenian Hiking Society who I’d met on the Sam Merrill Trail above Altadena in California. 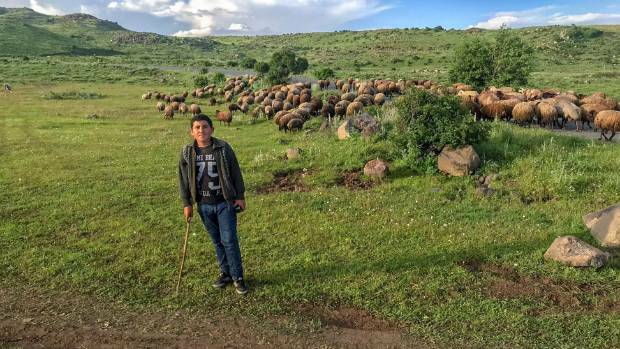 It wasn’t until I got to Armenia that things fell into place and I met Hovik Mizrakyan, a jewellery designer and strong hiker affiliated with FindArmenia.com. Marc and I camped the night before at the subalpine Kari Lake. There were no fire pits, picnic tables, fee stations or infrastructure that you would expect when car camping. Mizrakyan would meet us the next morning. We met a group of Belgians camping nearby, led by Nver Avetisyan, a friendly mountain guide. He drove the only Dodge Caravan we saw on our trip (“I like American cars,” he said). He invited us into his dining tent for some tea and coffee. We brought a bag of ripe cherries we had bought earlier and talked about the future of democracy in Armenia. 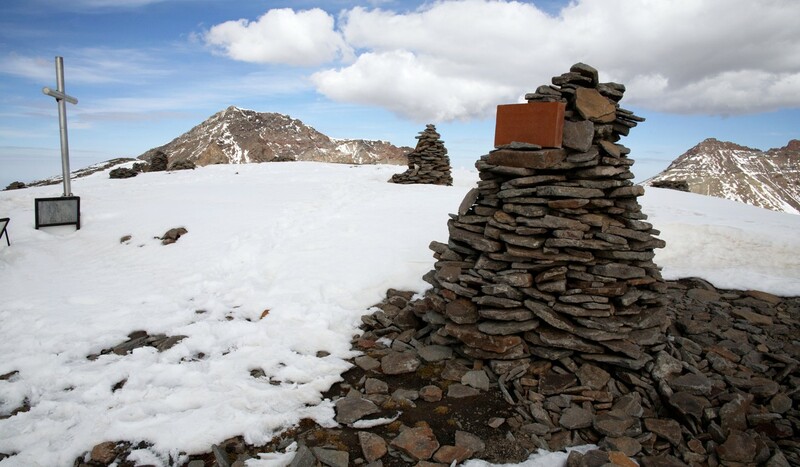 Mount Aragats has four peaks, the highest being the north summit, at 13,420 feet (4,090 metres). It was still snow-covered in mid-June and would have required a 6,000-foot vertical climb in one day or an overnight stay in the crater. Either way, we would be traversing deep, soft snow. The weather wasn’t cooperating. The Caucasus Mountains can be unpredictably stormy, with violent lightning. In the morning, the storm clouds roiled. So we cancelled climbing Aragats North and chose the much tamer Aragats South, at 12,756 feet. We weren’t disappointed. 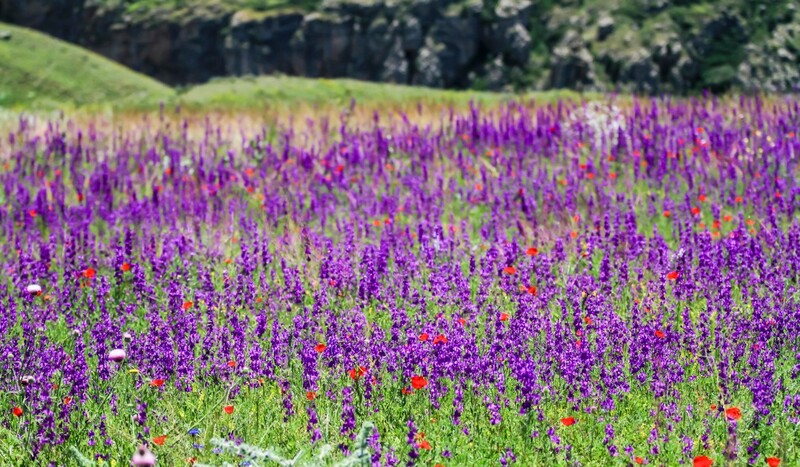 Our hiking trip barely scratched the surface of what Armenia’s four national parks have to offer. I ran out of time before we could get to Arevik National Park along the southern border. Maybe someday I’ll try again for Aragats North, knowing I’ll need more time. 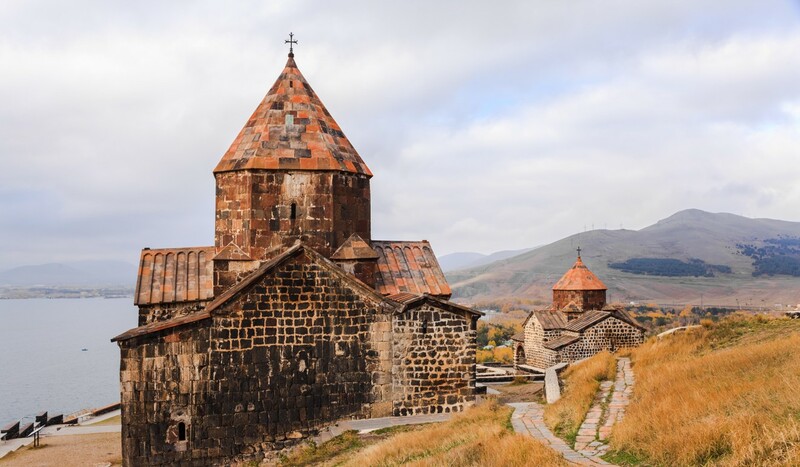 Aeroflot, Emirates and Qatar Airways offer connecting flights between Hong Kong and Yerevan.